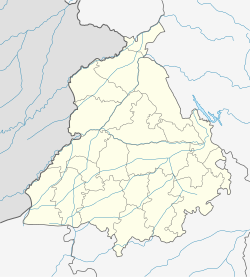 Khem Karan (Punjabi: ਖੇਮਕਰਨ) is a town and a nagar panchayat in Tarn Taran district of Patti tehsil of the Majha region of Indian state of Punjab. It was the site of a major tank battle in 1965 resulting it also being known as the graveyard of Pakistani tanks. The 1965 Indo-Pakistani War was witness to the largest tank battle (Chawindah) in military history between World War II and 1965. The battle led to the creation of Patton Nagar (or Patton City) at the site of the battle viz., Khemkaran. Khem Karan is an old town. Guru Tegh Bahadur (1621–1675) visited it. It used to be in Lahore district before partition of British India in 1947. It became a part of Amritsar district after the partition. Now it is in Tarn Taran district. Many of the town's residents migrated from nearby villages in modern Pakistan between 1947 and 1965, such as Nathuwala, Qadiwind, Rohiwal, and Sehjra. The towns Muslim residents migrated primarily to the city of Kasur, 8 km away in Pakistan. The town used to be easily accessible to the city of Kasur, Pakistan only 8 km away, and to Ferozepur 35 km away, but since India and Pakistan enacted border controls in 1953, and further restricted travel in 1965, the residents of the Khem Karan have been essentially cut off from both towns - Kasur lies in Pakistan, while the road to Ferozepur cuts through Pakistan, resulting in a detour of an extra 70 kilometre's drive. The townpeople, and those from surrounding villages, must now travel a long distance to Patti, Amritsar or Tarn Taran to procure any major goods, causing great inconvenience, and economic stagnation. The tank battles of 1965 form part of military history as the most intense armored battles between the end of World War II and the 1991 Gulf War. Close to a four hundred tanks, on both sides, took part in the pitched battles and offensives. At the start of the war, Indian strength was limited to one armored division and one independent armoured brigade, along with six armoured regiments supporting infantry divisions. Pakistan had two armored divisions, with the then very modern M-48 Patton tanks. India had an equivalent tank in the Centurion, but their strength was limited to only four armored regiments. Near the Bhikhiwind village, a strip of land was called Patton Nagar for a short while in 1965. It was here that more than 97 tanks of the Pakistani army were displayed at the end of the September India-Pakistan conflict. The Pakistan Army tanks were captured at the Battle of Asal Uttar by India's 4 Mountain Division and it became a memorial to the Pakistani tanks being bogged down in the marshes during the 1965 War. The tanks were displayed for some time after which they were shipped to various cantonments and army establishments in India for display as war trophies. Six Pakistani Armoured Regiments took part in the battle, namely the 19th Lancers (Patton), 12th Cavalry (Chaffee), 28th Cavalry (Patton) 4th Cavalry (Patton), 5th Horse (Patton) and 6th Lancers (Patton). The Indian armoured forces in the field that day consisted of three Armoured regiments with tanks of varying quality, the Deccan Horse (Shermans), 3rd Cavalry (Centurion) and the 8th Light Cavalry (AMX-13). On 10 Sep, 7 Light cavalry commanded by Lt. Col DS Jind,was inducted. The Regiment was equipped with New ineffective, amphibious PT-76 Russian Tanks.The crews were not trained to operate the tank.This was India's greatest strategic move, creating panic among the Pakistan Commanders, who were wrongly made to believe that 2 Indian heavy Armoured regiments had re-enforced this sector. Even though, the battle was fierce and intense, the Pak 1 Armoured was a formidable force. After the defeat at Assal Uttar and believing presence of addition armor, the commanders chose to pull out from this sector to save Sialkot. At the end of the war, the Pakistan 1st Armored division had lost about 97 tanks in destroyed/damaged or intact condition. This included 72 Patton tanks and 25 Chaffees and Shermans. 32 of the 97 tanks, including 28 Pattons, were in running condition. As of 2011[update] India census, Khem Karan had a population of 13,446. Males constitute 55% of the population and females 45%. Khem Karan has an average literacy rate of 61.55%, lower than the state average of 75.84%: male literacy is 67%, and female literacy is 54.85%. In Khem Karan, 12.14% of the population is under 6 years of age. In this village is the mausoleum (mazaar) of a Sufi saint known as Pir Baba Sheikh Brahm. Twice in a year a mela is held here. Wikimedia Commons has media related to Khemkaran. ^ Stephen Peter Rosen. Societies and Military Power: India and Its Armies. Cornell University Press. p. 246. ISBN 0-8014-3210-3. ^ Steve Zaloga, Jim Laurier (1999). The M47 and M48 Patton Tanks. Osprey Publishing. p. 33. ISBN 1-85532-825-9. Retrieved 12 March 2009. ^ "Census of India 2011: Data from the 2011 Census, including cities, villages and towns (Provisional)". Census Commission of India. Archived from the original on 16 June 2014. Retrieved 1 November 2013. This page was last edited on 1 April 2019, at 16:14 (UTC).